One of the most beloved African American superheroes in comics is finally being brought to life. It's been announced that four new TV series are coming to Netflix, based on the Marvel Universe: Luke Cage (also known as Power Man), Jessica Jones, Iron Fist, Daredevil. We're most excited about the Luke Cage series, a hero we've long wanted to see on the screen. Here are five things we expect (and hope) to see in the series. 1. Luke Cage's Origin - In the comics, Luke Cage is imprisoned for a crime he didn't commit. While in prison, he's subjected to an experimental procedure based on Captain America's Super Soldier serum that's supposed to give him immunity to all diseases. Instead, it gives him super-strength and invulnerable skin. I would expect some variation on that story. 2. 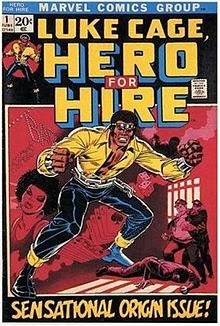 Luke Cage For Hire - The original Luke Cage comic had a great premise with Cage as a "hero for hire," sort of a superhero private detective. While he claimed to be a mercenary, Cage usually turned down the money in the end or did cases for free. I hope the miniseries keeps that premise, because it would naturally drive the series. Each episode would feature Cage hired to battle a different villain or conflict in the neighborhood. 3. An Urban Hero - At his heart, Luke Cage is a hero of the down trodden, the slums and disenfranchised, and minorities. He worked in New York's Harlem and Hell's Kitchen. Instead of taking on world destroyers, he helped out the little guy who slipped through the cracks that the Avengers wouldn't bother with. I hope that translates, and the series brings a minority perspective sorely lacking in the new comic media. 4. Cage's Rogues Gallery - To be fair, Cage doesn't have the greatest enemies. No Green Goblin or Joker level of villain in his gallery, but he does have a few that could make appearances. Cage's best friend turned knife-wielding mobster Diamondback, U.S. veteran turned militia leader Gideon Mace, and Chemistro, whose alchemy gun can change materials into other materials, are all possible villains. But the show is free to create a better class of villains. 5. Crossovers With the Other Series - In the comics, Luke Cage has close ties to the other heroes in Netflix's package. Iron Fist became Cage's partner in their long running series, Power Man and Iron Fist. He also worked with and fought Daredevil on multiple occasions. He had a drunken fling with (and eventually married) Jessica Jones, so I would expect some relationship between these two. And Netflix has already announced the four series will lead up to the Defenders, a TV movie equivalent of The Avengers with all four characters. NOTE: Isaiah Mustafa did a photo shoot trying to get himself cast as Luke Cage back in 2010. No word on whether he's going to be cast in the TV show. What are you looking forward to seeing? Are you excited about the Luke Cage series? Oh so he's strong and got thick skin. When I played the Ultimate Alliance video game I always wondered what his deal was. I always liked him with Iron Fist. The Yen to the Yang. I hope they do him right. 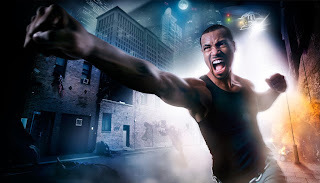 Must be Michael Jai White!